India’s largest crowdfunding site. Over Rs.545.43 Crores raised. 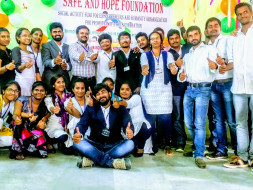 This is Rajkotichauhan Founder of SAFE AND HOPE FOUNDATION. Here we a group of Doctors came together for a change out of our career. We ourselves struggled and faced many problems to reach out this stage. We all are from different villages and different parts of India. As no one has come forward to stand with us and support wordly or morally or guiding. As we do live in village we first of don't have all the sources which we wanted for a man to pursuive their dreams. So as we faced alot of problems, we don't want others to face or imagine that being born in poor and rural and lack of knowledge and awareness will stop them Achieving their dreams. We wanted to stand strong and say them that you are "SAFE" and we are their for you and have a "HOPE" and Faith for Future. 1. I struggled for quality education and bold Education with diverse subjects and methods. 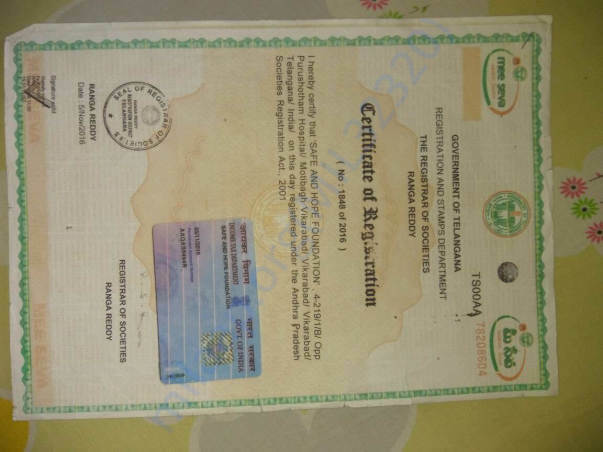 My poverty and illiterate parents Stood as hurdle for Education. Due to lack of Education my parents don't know where or what to get as Education. I moved different places and different schools and colleges to pursue. But none have given me the satisfaction of Education with fulfillment and all round development. I changed more than 15 schools and colleges upto now. 2.As I mentioned above I moved to different schools. Myself and my brother's used to go to school to bothalapallem a town like place nearby my village. We should cross a railway crossing in between our school. One day a accident took place almost 19 Members died in that accident. I lost two of my Brother's with whom i share everything even our names. Then I realised as our parents are having faith in us that we will be grow great and look after and fulfill their dreams and wishes. But as my brother's are no more who will look after them now. 3. My Aunt's son who is one year old and fell from roof and got paralyzed his body due lack of proper treatment due to lack of financial support and got nothing as financial aid from government. 4.Due to negligence and non support my friends mother forced into prostitution. I saw with my naked eyes. Even though she should be comforted with all benefits of which my uncle is alloted from government. 5. Saw many fraudulents in my life and experienced them and got cheated several times. 6. Saw loosing Humanity and Morality. All are always concern about power and money and status. Treat all as strangers, even Mom herself don't know the baby till she gives birth. 7. As myself wanted to do great things,Youth in the world wanted to do lots of great things like innovation and creative and conserve and great ideas to be brought into reality and into this world. But due to lack of proper Knowledge and awareness and understanding and cooperation and support and guidance and assistance and encouragement and platforms. Once while traveling In a train I fell from train footboard in the midnight and got survived. Then I realised, Their must be some reason for my birth. I born for a reason.i have to fulfill the reason for what I born. Why I should wait for someone to come and do these all or help. Why can't I start and be the "one" who all are waiting for to come and help. So I Studied and analysed and Done a research to know what can change this world and could solve the problem.
" Education and Youth " can do it. So I wanted to give a best Education and wanted to establish a best Education system. After analysing 4 Education systems in 4 different countries and taking 7 countries in reference. We built a new Education module. Where students learn Physically Intellectually and Socially. 60 subjects from Science and Technology and Art's and Culture and 25 languages are brought together for and all geographical influence and Future Scope are put forth and brought to the world. To establish a module school and explain and give seminars and workshops and conferences and events and let the world. How important this step is and how it could help and save the future of the world. We wanted funding for Building and bringing this module in existence. Wanted to complete this module by end of December 31st 2018. I request all the one who are out their. Please contribute whatever you can and support us to build the Education system of Future. I am not asking for my sake or Profit sake or for any other personal endeavours. I am requesting you all for the sake of our future generations. This is the right time to stand for our children's and families and future generations. This is right time to teach them what is Education and what is life and what exactly we wanted. Safe the world and change the education system..